Welcome to MikeandTheMouse: Brian Reif - the true epitome of a Disney Cast Member! Brian Reif - the true epitome of a Disney Cast Member! Give Kids the World is a non-profit resort in Kissimmee that offers children with life-threatening illnesses and their families, free, weeklong vacations where they can experience the best of Central Florida. 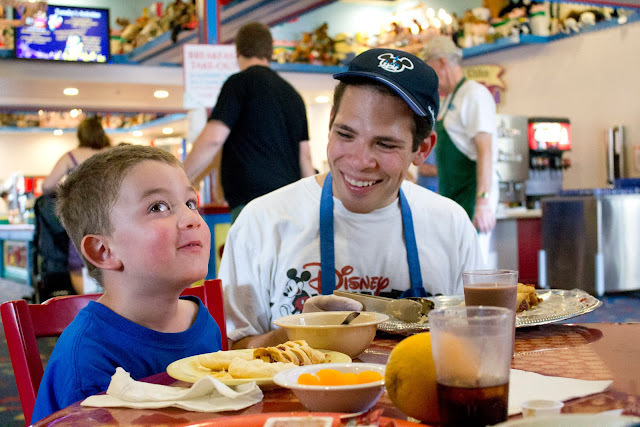 Since 1986, GKTW has welcomed more than 115,000 families from all 50 states and more than 70 countries. The organization depends on volunteers to fulfill approximately 1,500 shifts every week. “I’m one of the facilitators of new volunteer orientation, which gives me the ability to use my Disney storytelling skills to get new volunteers excited about joining the team,” said Brian, a Cast Member since 2002. Behind the scenes, Reif, who works as an information technology specialist at Team Disney, applies his expertise with computers and technology to improve several operational areas at the Village, including efficiency, training and overall experience. Reif is one of thousands of Disney VoluntEARS who donate their time and resources to help community organizations. Last year Cast Members volunteered 208,000 hours to local groups and earned more than $800,00 in grants for Central Florida nonprofits. Nearly 700 Walt Disney World VoluntEARS also received the President’s Volunteer Service Award from the White House for contributing more than 100 hours of service.